Subject: Plate 3274: Unknown species. This plate was published in 'Curtis Botanical Magazine.' on Oct 1, 1833. Text leaf(ves) included. Medium: Etching / Engraving, with original hand coloring. Size (in cm): The overall size is ca. 13.5 x 23 cm. The image size is ca. 11.5 x 20 cm. Size (in inch): The overall size is ca. 5.3 x 9.1 inch. The image size is ca. 4.5 x 7.9 inch. Description: This rare and delicate plate originates from: 'Curtis Botanical Magazine.' William Curtis began publication of the Botanical Magazine in February 1787 and it continuedeven after his death almost without interruption until 1948. The images were engraved and hand-coloured by many reknown artists. The plates are known for their fine detail and delicate hand coloring. The prints are all copper engravings to Volume 70, then continue with stone or zinc lithography until the introduction of color printing in 1948. 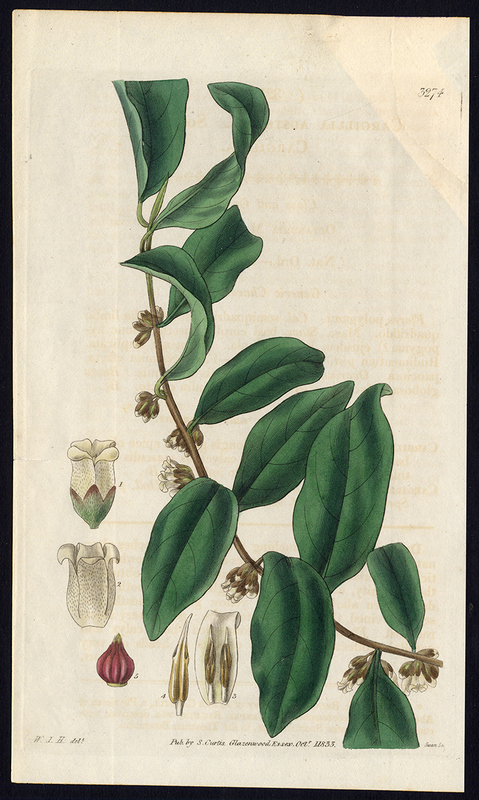 Artists and Engravers: William Curtis (1746-1799) was an English botanist and entomologist. Curtis began as an apothecary, before turning his attention to botany and other natural history. Curtis was demonstrator of plants and Praefectus Horti at the Chelsea Physic Garden from 1771 to 1777. He established his own London Botanic Garden at Lambeth in 1779, moving to Brompton in 1789. He published Flora Londinensis (6 volumes, 1777ï¿½1798), a pioneering work in that it devoted itself to urban nature. Financial success was not found, but he went on the publish The Botanical Magazine in 1787, a work that would also feature hand coloured plates by artists such as James Sowerby, Sydenham Edwards, and William Kilburn. This plate engraved by Joseph Swan.